Find below the results from last night’s gala, including relay splits, and the overall league positions. We are 7th in the league which places us as top seed in gala 3 of Division 1 against Worthing and East Grinstead. This means we are are host for the final gala (and need the pool booking please!!). Unfortunately both the other teams have already hosted as well, so it’s down to us as top seed to host again. 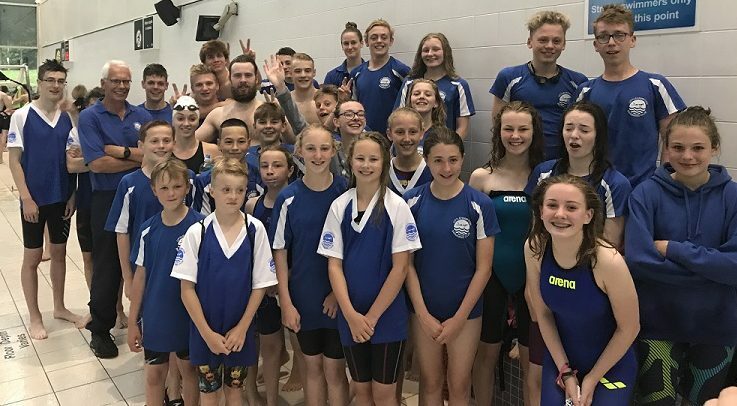 Last night was always going to be very tough against larger clubs fielding a good number of national level swimmers. None-the-less our team rose to the challenge and we saw 24 PBs, plus a number of swims that would have been winter county qualifying times had this been a licensed meet. This included Zac Evans who stepped into the 100 breast last minute and swam over 2.36 second PB well inside that county time! So everyone please check your times and make sure you enter meets to license those times!! It was great to have Calvin, Lewis and Charlie join the team this round. They did not disappoint, with three 1st places from Calvin, a 1st & 3rd from Lewis and 2nd & 3rd from Charlie. In all we had 10 individual 1st places. Euan was superb again winning 3 of his races; Tom Hogg swam one 1st and two 2nd places; whilst Jess Brown got the other 1st place in her 100 fly. There were some stunning relay wins too. The 13 & under boys Calvin Fry, Ollie Harvey, Tom Hogg and Archie Strowger won both their relays by some distance. Our open men’s team Will Condron, Charlie Hodges, Will Redwood and Sam Munro won the freestyle relay, but the medley team was just pipped to the post. So a great night’s swimming and a valiant team effort against tough opposition. Thank you to our lovely helpers: Mark Savill who refereed; Mark Brown and Daren Pryke who judged; timekeepers Simon Hogg and Kerry Iden; team managers Pip Redwood, Tina Le Merle, Maz Eames and Ciara MacLeod; and of course Keith on a lane end.